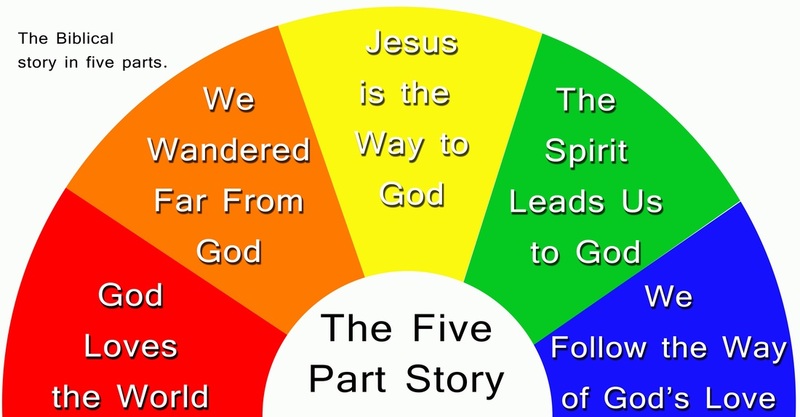 The Five Part Story is a framework which organizes the entire Biblical story into five easy to remember movements. It begins at creation with God loves the world, continues with the fall in Genesis where humanity began to Wander Far From God, moves next to Jesus is the Way to God where we discover that in Jesus Christ we encounter the love and grace of God, which leads us to Pentecost where we learn that The Spirit Leads Us to God, and it is drawn to a conclusion with the place where our story intersects the Biblical story in We Follow the Way of God's Love. To learn more check out the video below.